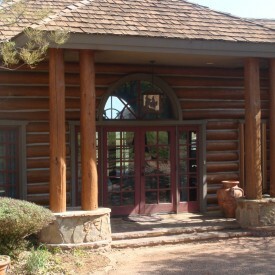 The best company for log home restoration in the Bella Vista AR area is 888-LOG-GUYS! From the very first contact until the finished project, you will be amazed by our outstanding professionalism and customer service! Even after the project is complete, you will have our company by your side for future maintenance issues. We stand by our work, and our loyalty lasts a lifetime! Check out the work we have already done and testimonials of our clients. You can contact us by phone or request a consultation from our website for more information! 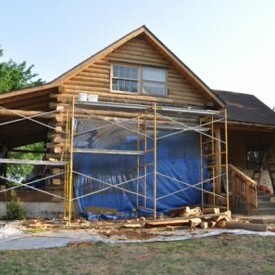 With our knowledge and experience, our crews at 888-LOG-GUYS know how to properly restore log homes. There is no need to worry about whether or not your log home is getting the correct care it needs. Our process includes media blasting or stripping the stain off the logs before sanding the logs (per your request) and cleaning the logs with a borate treatment. Next, (as another option) our guys will apply or repair your energy seal, and then finally, stain your logs with the product or your choice (and perhaps our recommendation). Leave all the hard log home work to us! 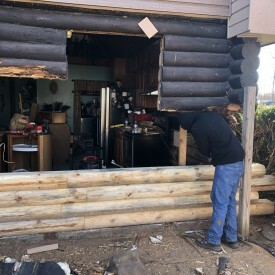 If you have log rot, severe log rot, water damage, bugs burrowing into your logs, or birds pecking at your logs, then you can call 888-LOG-GUYS for the best solution for your log home! We are dedicated to fixing your log home so that you feel safe, and we want you to be satisfied with the quality of your log home. There is no project too big for us as we have not only repaired small amounts of log due to rot but also replaced whole walls due to severe log rot! You can count on us to get the job done right! Call us today for an estimate! Have you felt air drafts around the edge of your windows? Have you seen water leaking and running down your inside walls? Have bugs somehow invaded your home? You don’t need to put up with those nuisances anymore! We will close the gaps in between your logs by properly chinking or caulking your log home in the Bella Vista Arkansas area. This will protect your log home and keep you comfortable living in it. You can give us a call or request a consultation from our website! You love your log home, right? But, is there something else you would like to add to it? 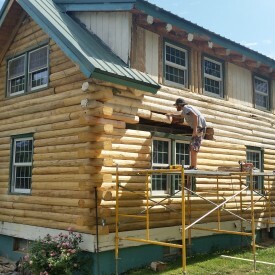 Our crews at 888-LOG-GUYS have the knowledge and experience to construct additions to your log home to make it even more beautiful. 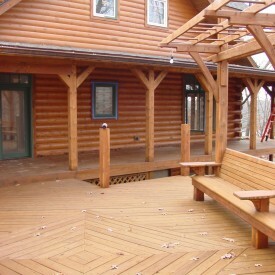 We can build decks, porches, and patios. We can construct log staircases. We can build log railings for a loft or other structures. 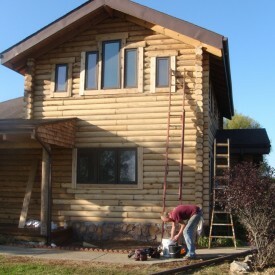 No matter what ideas you have, let us know, and we will give you an estimate for the log home project you have in mind! After restoring a log home, we don’t just say “good-bye” and expect our client to take care of their log home from that time forth. As a matter of fact, we let our clients know that we will always be around for any log home care that will be needed in the future. We keep track of when each log home will be in need for upkeep and maintenance to make sure it stays in great condition. We will literally do all the work (cleaning, re-staining, and sealing), and you don’t have to worry at all! Let 888-LOG-GUYS make log home ownership a hassle-free experience. Call us today!